Russian-speaking older adults are increasingly becoming clients of Jewish Family Service. Adam Halpern, Director of Older Adult Services, answered some questions to help us learn more about the 2017-18 holiday events that JFS and its partners are providing for this particular part of our Jewish community. The Passover Celebration for Russian Seniors is Wednesday, April 4. Why is JFS offering holiday celebrations for Russian-speaking older adults? Our day-to-day work with clients often focuses on helping them meet basic needs, such as housing, health care, food and in-home care. Just as important as these basic needs, however, is a client’s mental health. Our holiday programs are a critical piece in improving clients’ mental health, and in turn, their physical health. In the former Soviet Union, Jews didn’t have an opportunity to learn about their culture or religion. Now that these Jewish, Russian-speaking older adults have the opportunity, many are eager to learn. Unfortunately, language and cultural barriers make it hard for them to integrate into the existing, organized Jewish community. And, aging-related disabilities can further exacerbate their linguistic and cultural isolation. Tell us more about the impact these celebrations can have on well-being. Social opportunities like these reduce isolation, and thus, loneliness among our Russian-speaking older adults. Research shows that reducing isolation and loneliness can lead to better health and mental health outcomes. Like all people, our clients are often searching for meaning and connection in their lives. 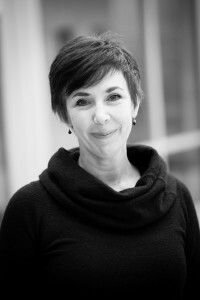 These events can provide that connection as well as a deeper sense of meaning for those who have previously had little exposure to their Jewish heritage. Could you elaborate on the particular challenges Russian-speaking older adults in our Jewish community face? They face many of the same challenges as other low-income older adults — medical issues, financial instability, transportation difficulties, and sometimes housing instability. Often, they are even more isolated than other older adults due to language and cultural barriers. Finally, many of these individuals in our community are Holocaust survivors. As a result, they may have mental health concerns related to surviving two traumas— first the Holocaust and then being Jewish amidst the anti-Semitism of the former Soviet Union. Why Jewish holidays and not some other social activity? There are no other organizations consistently providing cultural events specifically for our Russian-speaking clients, so we felt it was imperative we take the lead in making this happen. At the same time, we know there is abundant Jewish religious and cultural expertise in our region, so we wanted to develop those community partnerships to support the events. Many Russian-speaking older adults live on the Eastside, so partnerships with Eastside organization has been particularly valuable. What other factors have helped make these new events a success? The Russian-language aspect is the most critical. Other considerations include offering the programs during the day when it is easier for individuals to leave their homes. And, whenever possible, we help with transportation. Essentially, we do all we can to create environments in which people can truly feel comfortable. 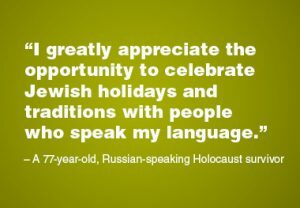 In 2017-2018, JFS and its partners are providing older adults Russian-language holiday celebrations for Rosh Hashanah, Sukkot and Passover. JFS is grateful for the collaborative partnerships with Eastside Torah Center, Endless Opportunities, Panim Hadashot-New Faces and Temple De Hirsch Sinai that make these events possible.